Goodbye, chickens . . . Some time ago I wrote about ses galines de sa rotonda – the flock of chickens that had been living in the middle of a traffic roundabout at Plaza Madrid in Manacor for the past couple of years. After an unpleasant episode involving some stray dogs, our feathered friends were recently given a safe ‘home‘ by the local council. Bravo, I thought, at the time. The island newspaper Diario de Mallorca wrote an article last month about the installation, designed to keep the chickens safe from prowling pooches. The article explained that if the flock grew to more than the usual 15-20 birds, any surplus would be relocated to Natura Parc. Fair enough. But this week we noticed that the chicken hut has disappeared. And, it seems, so have all the chickens – unless anyone has actually seen them in recent days? Looking at various comments on their Facebook page (3,188 ‘likes’) – if my translation of mallorquín is accurate – all of our feathered friends have been sent to Natura Parc. They’ll be sadly missed by their many fans . . .
← Life behind bars in Mallorca! 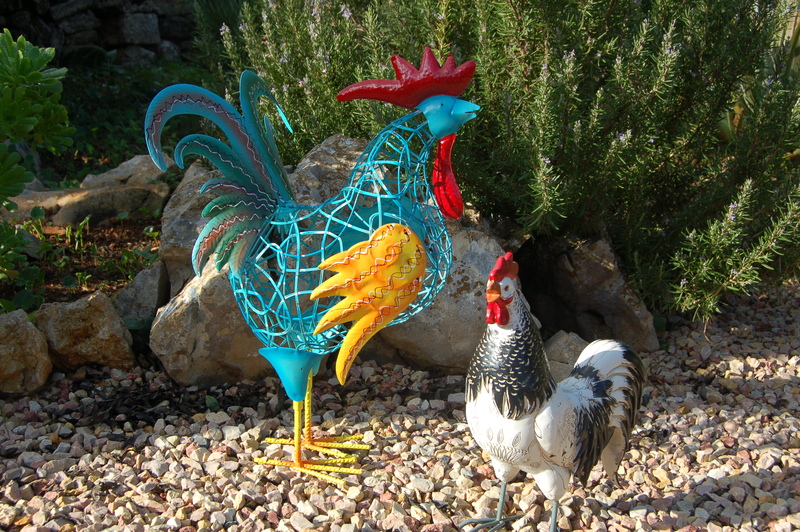 Bring back the chickens….to an otherwise boring part of Manacor. The chickens were reminiscent of the old days. It was eccentric to see them pecking about on the roundabout and was a reminder of times before health and safety went mad, and everyone was a yuppy, and when buildings and places had character. Being one of the yuppies I refer to, I suppose, I’m part of what I see as a decline in individuality and the unusual. I and my partner bought one of the fisher houses in Porto Colom. We have no particular reason to visit Manacor but found ourselves there one very wet day in August (looking for a computer hard drive shop..). We couldn’t find anywhere to eat but noticed two cafés on the roundabout. One looked slightly “smarter” than the other but the other had a hand written menu that made us think that perhaps the food would be home cooked. It was and it was fab – very cheap and cheerful, down to earth, and served with a smile. We sat outside watching the traffic circling the roundabout, in the pouring rain. Then we noticed the chickens. Just lovely – I do hope there’s a fuss, and that they come back! !